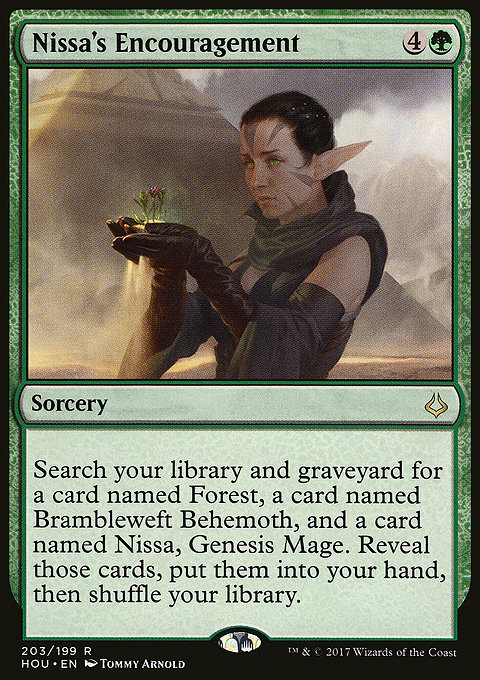 Search your library and graveyard for a card named Forest, a card named Brambleweft Behemoth, and a card named Nissa, Genesis Mage. Reveal those cards, put them into your hand, then shuffle your library. 2017-07-14 You can find any or all of the cards listed with Nissa's Encouragement. You could even find none, but that wouldn't be very encouraging. 2017-07-14 Nissa's Encouragement can't be used to find a card with the land type Forest that isn't also named Forest (such as Sheltered Thicket from the Amonkhet set).